Chef-Owner Martin Faucher of the French restaurant, Aux Truffes Restaurant in Mont-Tremblant, Canada, which has been awarded Four Diamonds by the AAA/CAA every year since 1998, shares a delicious taste of his restaurant with his two-course menu of Magret de Canard Stuffed with Foie Gras and Truffles, and Clafoutis with Raspberries and White Chocolate. Bon Appétit! I had the opportunity to meet Chef Martin Faucher and get to know him and his culinary philosophy when Edward and I had dinner at Aux Truffes Restaurant in late February 2011. A native Quebeçois from the south shore of Montreal, he was a rebel at age 16 and a fan of heavy metal music. He got involved with cooking when a friend told him about a cooking school that his brother was attending. It sounded interesting, so he applied and was accepted. From there he honed his skills working at various restaurants. Between jobs, he took a trip to Columbia, South America, and there he met someone who told him about Mont-Tremblant. 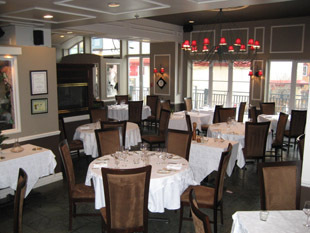 He returned to Canada, went to Mont-Tremblant, and was walking around the Pedestrian Village when the Aux Truffes Restaurant caught his eye with its elegant setting. He went in and inquired if they needed any help in the kitchen, they did, he accepted, and began working there as a cook in 1999. Little by little, he worked his way up to head chef, and when the owner wanted to sell the restaurant, he decided to purchase it and became the owner on February 15, 2009. Chef Martin Faucher's culinary approach is not to use set recipes, but rather to go along, always playing and finding new ways to present his food, to think out of the box, add a little spark that ignites everything. He loves the winter season for heavier comfort food, and the spring and summer for the fresh products. He uses butter and fat in his recipes, as he explained that the fat is what carries the flavors, and uses local duck and venison, as well as the raw milk local cheeses that have really evolved over the past 15 years. When not creating new recipes for the restaurant he enjoys skiing, as well as spending time with his wife and two children, a son age 18 months, and a daughter age 5 ½, who likes to cook with her dad and make recipes from scratch. Perhaps there is a budding sous chef in the Faucher home. 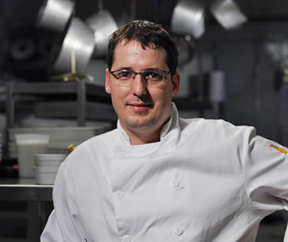 Chef Martin Faucher graciously shares his recipes for a delicious two-course menu. This recipe is a signature plate of Aux Truffes Restaurant, and a unanimous delight. At the restaurant, I serve it with roasted vegetables, veal and truffle glaze, and quinoa and foie gras. Go easy with the vegetables, the starch, and the sauce of your choice, to let the artistry of the magret of duck star on the plate! To watch Chef Martin Faucher make the Magret of Duck Stuffed with Foie Gras and Truffles, please view the video at www.recettes-de-chefs.ca/blogs/les_recettes_martin_faucher/default.aspx. Method: In a pan on a very hot stove, add the foie gras and cook for 1 - 2 minutes on each side. Cool, and then chill in the refrigerator for at least 20 minutes. Trim the fat along the sides of the magret of duck, reserving the trimmed fat for other uses. With a sharp knife, score the fat on the diagonal. Rub a good quantity of fleur de sel or iodized salt onto the fat. Put in a dry pan with the fat side down, and sear for 15-20 minutes or until the fat has crystallized like bacon. Important: drain the fat as necessary throughout the cooking process. Season the meat and sear all sides in a pan over medium heat. Remove form the heat and let rest for 5 minutes at room temperature. Hold the magret lengthwise on a plate using tongs, and with a very sharp knife, make an incision lengthwise in the center of the magret and slightly widen to create a space for the filling, being careful to not cut through the end of the meat. Pre-heat the oven to 450° F (232° C). Julienne the truffle. Stuff the magret of duck alternately with the truffle and the foie gras. Cut into smaller dice if necessary. Place the magret in oven for 4-5 minutes and cook until done. Let rest for 2-3 minutes. Arrange the plate with the vegetables and your choice of starch. Cut the magret in slices and serve with a veal and truffle glaze or your choice of sauce. The secret for this bland dessert is definitely the cream. The marriage of the cream with the acidity of the raspberries is what makes for a winning combination. At the restaurant, I prepare the Clafoutis all year with frozen raspberries. It is not necessary to thaw them before mixing them in the batter. Easy and delicious! To watch Chef Martin Faucher make the Clafoutis with Raspberries and White Chocolate, please view the video at www.recettes-de-chefs.ca/blogs/les_recettes_martin_faucher/default.aspx. Method: In a saucepan, heat the milk and the butter without boiling, until the butter melts completely. While you are waiting, mix the flour and the sugar together in a bowl and set aside. Make a well in the flour sugar mixture, and add the eggs. Beat until they are gradually incorporated into the flour and the sugar. When the butter has melted, turn off the heat and add the white chocolate. Stir just until the chocolate melts and is completely incorporated. Add the warm cream to the flour, sugar, and eggs mixture and mix well. Place a sheet of parchment paper in a rectangular loaf pan 4.7-inches x 1.5-inches (12 cm x 4 cm). Add the batter and mix in the raspberries. Bake in a pre-heated 375° F oven for 40 minutes. Check after baking for 20 minutes. Temper in the refrigerator for about one hour. Remove the Clafouti from the mold, and cut into individual slices. 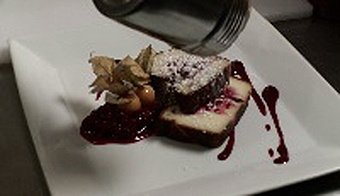 Dust with confectionary sugar and serve with a raspberry or cherry coulis, if desired. Bon Appétit! Aux Truffes Restaurant is open daily during high season for lunch for lunch from 11:30 am - 3:00 pm, and for dinner from 6:00 pm - 11:00 pm. Read in-depth on Aux Truffes Restaurant in the Restaurants section and in the Chefs' Recipes section where Chef Martin Faucher provides the recipes in French. Read other articles on Mont-Tremblant, Canada in the Destinations, Hotels and Resorts, Restaurants, Chefs' Recipes, Spas, and Adventures sections. For information on Porter Airlines, and where they fly, please visit the website: www.FlyPorter.com. © March 2011. Luxury Experience. www.LuxuryExperience.com All rights reserved.